Life Cycle Assessment | IBU - Institut Bauen & Umwelt e.V. From cradle-to-grave – a life cycle assessment is the systematic analysis of a product over its entire lifespan. 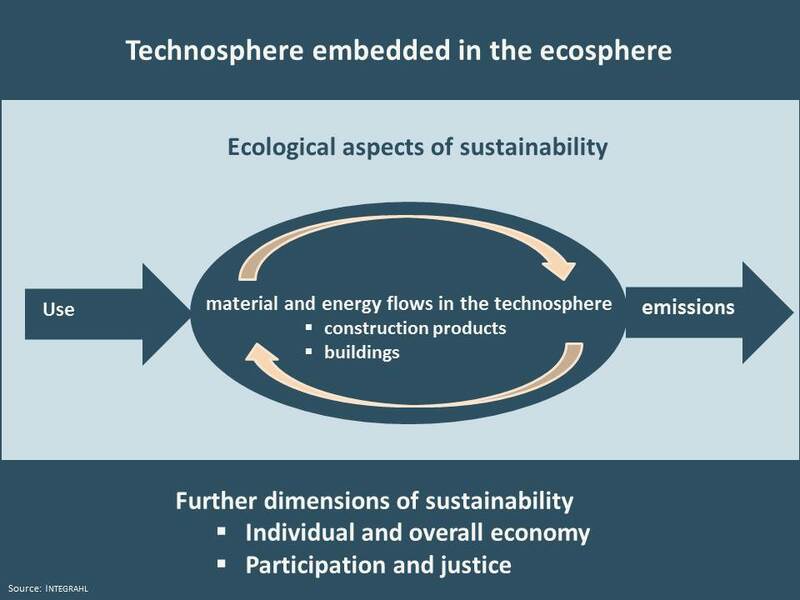 Resources are taken from the ecosphere, emissions released into air and water, and waste is generated. 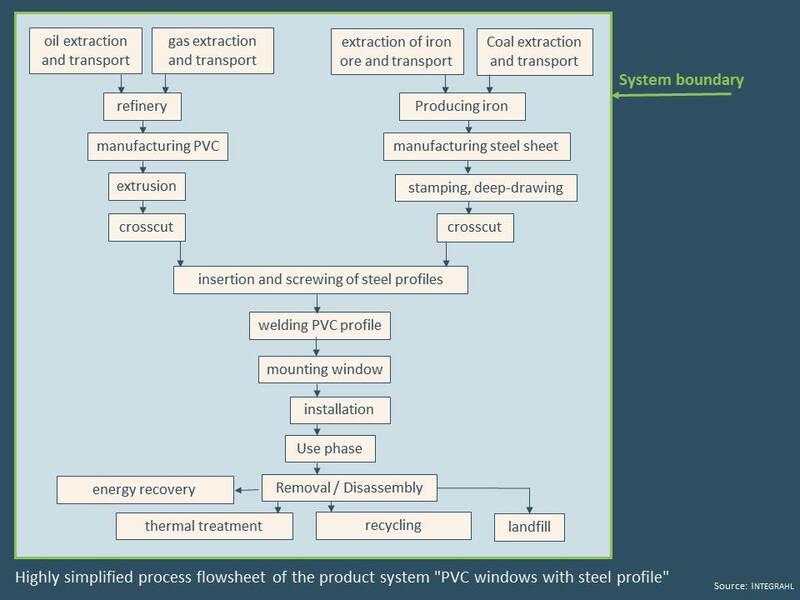 During the life cycle assessment of a product, each and every aspect is taken into consideration, from raw material extraction to producing the material and manufacturing the product. Furthermore, there is the use-phase and finally, every process at the end-of-life phase. For the product portfolio many data are to be collected and standards [ISO 14040] and [ISO 14044] provide the respective methodology and guidelines. Life cycle assessments provide detailed and transparent data on construction products and their environmental impacts. Among other uses, this data forms the basis for Environmental Product Declarations, which are an important component for the well-founded evaluation of a building’s sustainability. 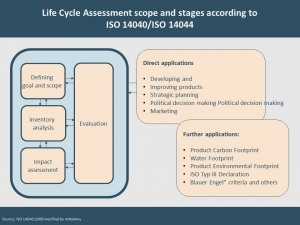 The life cycle methodology according to standards [ISO 14040] and [ISO 14044] is divided into four phases: Defining Goal and Scope, Inventory Analysis, Impact Assessment and Evaluation. According to standards [ISO 14040] and [ISO 14044]. Applications of life cycle assessments are not specified. During the first phase Defining Goal and Scope, important parameters are determined. Two essential parameters are determining the functional unit and the system boundaries. Inventory analysis is the second phase, where in an Input-Output analysis, data of resource use and emissions are collected for all processes in question. The Inventory analysis provides a large amount of data on material flow (emissions, resource use), as well as energy usage, which are difficult to manage in a clearly structured way. Impact assessment is the third phase, where data from the inventory analysis are brought together in regard to their potential environmental impact. This way, the ecological relevance of the results of the inventory assessment are easier to understand. The impact categories that are to be covered by an analysis have to be specified in the first phase (Definition of Goal and Scope). This is especially important since the data collected in the inventory analysis follow the demand of the impact assessment. The results from the inventory analysis and the impact assessment show the focus of the respective environmental impacts (e.g., climate change/ global warming potential, eutrophication and acidification potential), and it also shows the inventory analysis indicators (e.g. cumulative energy demand – CED). According to each life cycle assessment phase, priorities for optimization can be identified. During the fourth phase, Evaluation, the results from the inventory analysis and the conclusions for the impact assessment are taken and recommendations are given in regard to the goal of the analysis. Life cycle assessment results are an important component of the environmental evaluation of buildings. The extent to which a building affects the environment can be defined through the energy and material flows that develop over the building’s entire life cycle, and the products used in its construction. The life cycle assessment data from the individual building products used in a building forms the basis for the environmental analysis of that building. EPDs are an established instrument of communication for the entire construction industry, in which this data – prepared for analysis at the building level – is consolidated and transparently conveyed. 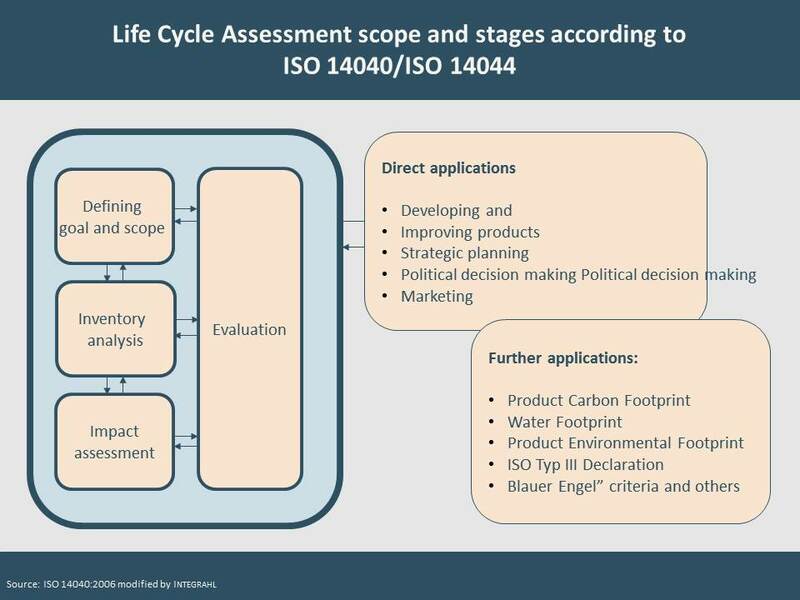 The Basis for the Life Cycle Assessment (LCA) are the International Standards ISO 14040 and ISO 14044. For Environmental Product Declarations of construction products, European standard DIN EN 15804, “Sustainability of construction works – Environmental Product Declarations – core rules for the product category of construction products”, in which the calculation methodology, scenario creation and effect indicators are provided, has been in effect since April 2012. It specifies the uniform publication of life cycle assessment results for building products on a European level on the basis of ISO 14040 and ISO 14044. For building life cycle assessments, DIN EN 15978, “Sustainability of construction works – Assessment of environmental performance of buildings – Calculation method” applies. This standard describes all principles and requirements for the evaluation of buildings with regard to their environmental quality. The life cycle assessment is a methodological tool that is originally used in operational environmental management. 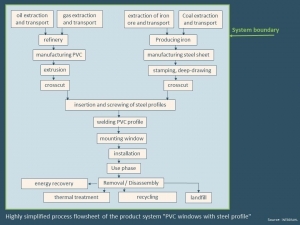 The systematic analysis of all input and output streams over the entire lifespan of a product, which provides a transparent and detailed look at its potential impact on the environment. In a life cycle assessment, the complete life cycle of a product, i.e. all stages, from the extraction of raw materials to production, application, waste treatment, and recycling, up to the final disposal, are assessed – “from cradle-to-grave”. Not only are the environmental effects of the production process of a product considered, but also its primary products. Even auxiliary and raw materials and supplies, such as glue or cooling agents, flow into the analysis, as well as energy production processes, the production and supply of the necessary raw materials, and all transport. Likewise, another part of the life cycle assessment is the disposal and/or recycling of the product and its components. 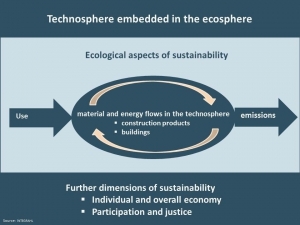 Thus, a life cycle assessment is a type of “environmental history” of the product, which can help show the manufacturer and/or supplier the potential for improvements in the raw materials used and/or energy efficiency, and for keeping the environmental effects and stress as minimal as possible. In considering the life cycle of a building product, it should not only be viewed at the level of the product itself, but must be extended to the level of the building. Building products are not end products; their environmental effects unfold, therefore, only in connection with the building for which they were intended.